Backing boards for conservation-quality picture framing should be selected carefully, since placement of the original on the backboard leads to maximum possible contact. Apart from backing boards made of solid board, KLUG-CONSERVATION offers backing boards composed of single-/ multi-ply corrugated boards as well as of honeycomb panels. Backing boards should be ageing resistant and offer low/zero emission. Backing boards made of secondary raw materials, synthetic materials or wood pulp are not suitable for use in conservation-quality picture framing. 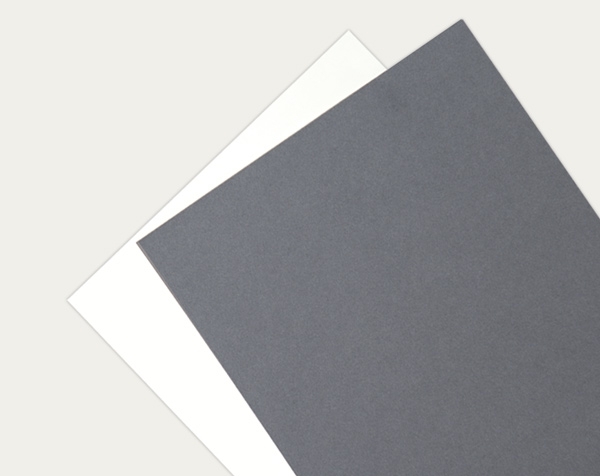 An economically priced backing board in natural white/grey-blue and in grey-blue/white7grey-blue, specially developed for conservation-quality picture framing and mounting. The board is free of optical brightening agents and has passed the Photographic Activity Test (PAT) in accordance with ISO 18916.